It’s the start of a new month, and there are still so many talented Philly rap artists who have made an impact on this culture and on me who I did not get to mention in April. So I’ve decided to extend my homage to Philly rappers through the month of May. When I think of one of the most talented rap groups to date who encompasses the complete package of lyrical ability, originality, style, and stage presence, I think of “The Legendary Roots Crew.” These guys not only put Philly on the map but also put the United States on the map for producing some of the most innovative, talented artists. I was in high school when I was first exposed to The Roots, and I ran their first full-length album, “Do You Want More,” into the ground. What initially captivated me about The Roots was their sound; who ever heard of a rap group with a band who did more than just sample? It was unlike anything I had ever heard before and is more than likely the reason for their longevity in the music industry today. What is it that makes this specific song so profound? Well, before I get into that, I must say that The Roots have an arsenal of profound lyrics, and I could potentially do a month dedicated to them. Nevertheless, I selected this particular song, “Sacrifice” and the chorus of the song as profound because Black Thought (featuring Nelly Furtado) is doing much more than “spitting a few lines;” he’s evoking listeners to think by presenting us with words to live by. We all want better lives for ourselves, but at what cost are we willing to pay or how much are we willing to endure to attain those dreams and goals? Many people have a sense of entitlement and don’t want to work for anything. Some people give up easily if there are a few barriers in their way. Most people have heard the old adage, “The best things in life are worth fighting for,” but Black Thought takes it a step further in acknowledging that sometimes we all most cry before we can smile. The Roots’ lead rap artist, Black Thought, is an exceptional lyricist and often employs many of the different literary elements found in some of the most well written poems of our time. In this in particular chorus, he uses a lot of figurative language, which is the opposite of literal. This means that what is being presented is either not plausible or possible or even exaggerated. What does it mean to have “A heart that’s filled with music?” Think about the causes and effects associated with music and how many genres exist. Music can be in accordance with your mood, or it can assist in changing your mood. As you make sacrifices, shuffle to the appropriate music (literally and figuratively) to see you through, and eventually you will be able to fly high with a smile on your face. Thanks. 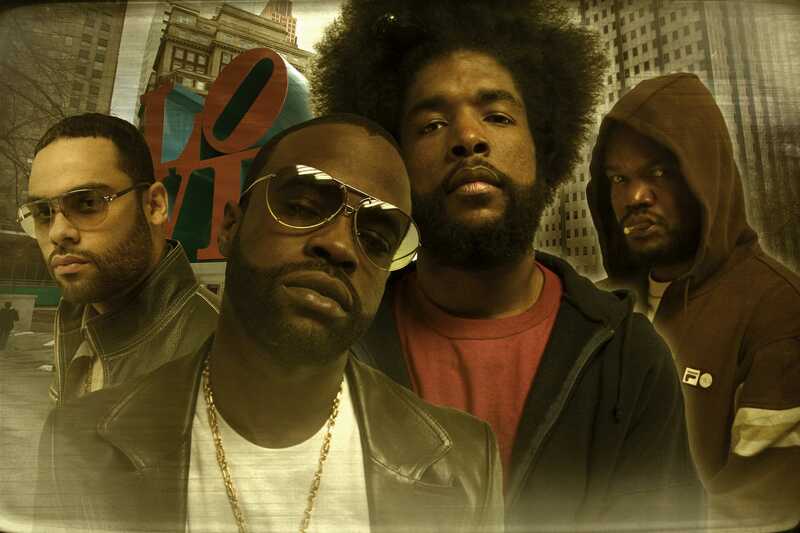 The Roots are hip hop pioneers in their own right, and I’m certainly looking forward to their 13th album.